It's just so...pretty up here. Editor’s Note: Due to the sheer size of Elder Scrolls Online, we’re publishing our hands-on impressions in three chunks. Here’s part one. I dash up a sandy dune, rushing past palm trees, looking for the spot on my map where an eyeball icon beckons my attention. The sky is blue — it’s mid-day here in the Hammerfell region — with a few clouds to tease the eye. It’s hot enough to fry an egg on my heavy armor, but hey, I’m not really running anywhere. As I crest the little hill, a brilliant lens-flare from the sun draws my attention skyward, distracting me from the broken bridge. I tumble heavily to the sea below, splashing into the water. I’m in good company: there’s a small school of orcs and elves who have made the same rookie mistake. We make the slow swim of shame to the sandy beach, then rush off to explore this idyllic, if tricky, land. 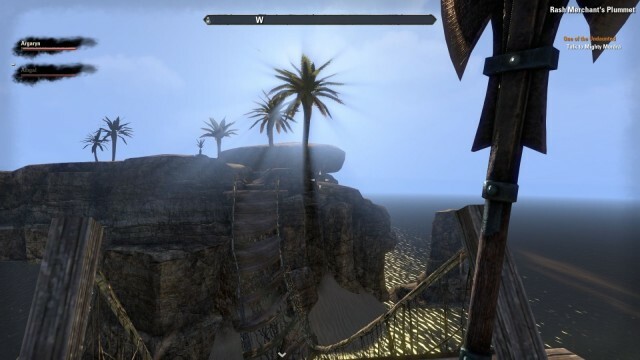 This all takes place on the continent of Tamriel, which will be familiar to gamers who’ve played the previous titles in the series: Skyrim, Oblivion, Morrowind. It’s like Middle Earth for game nerds. While each of the previous games took place in just one area of Tamriel, the Elder Scrolls online promises the whole land mass. It’s paradise –I wonder if I can bring my kids with me when I move here. 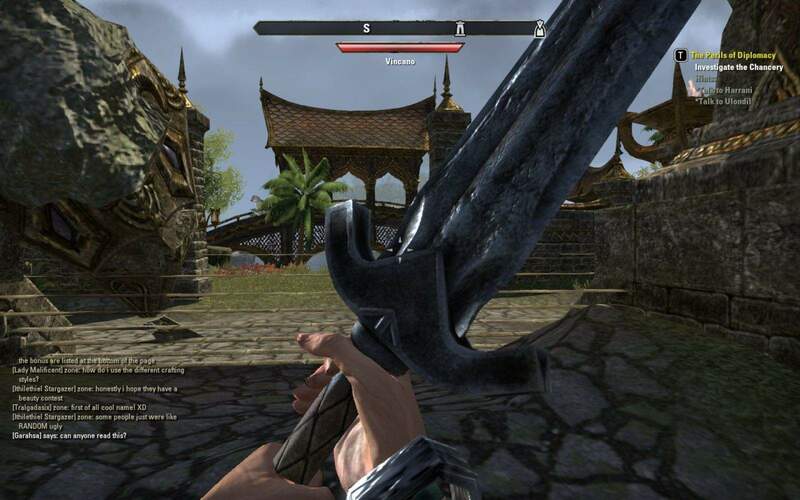 Elder Scrolls Online is one of the most hotly anticipated MMOs in recent memory. It’s been in development by Zenimax Studios for five years, already, and just released for public Mac and PC consumption by long-time series publisher, Bethesda. The beta alone registered five million people who wanted to play the game before its release; that’s roughly the population of Norway. The amount of things to do and see is staggering, as well. The number of characters that players can create can only be expressed with a crazy exponential number (above), and there are over two thousand books in the game you can read. Seriously, it would take you 32 hours to read them all. That’s just reading — this Bethesda infographic has a ton of fun and useless info on all the stuff you can do in the game. 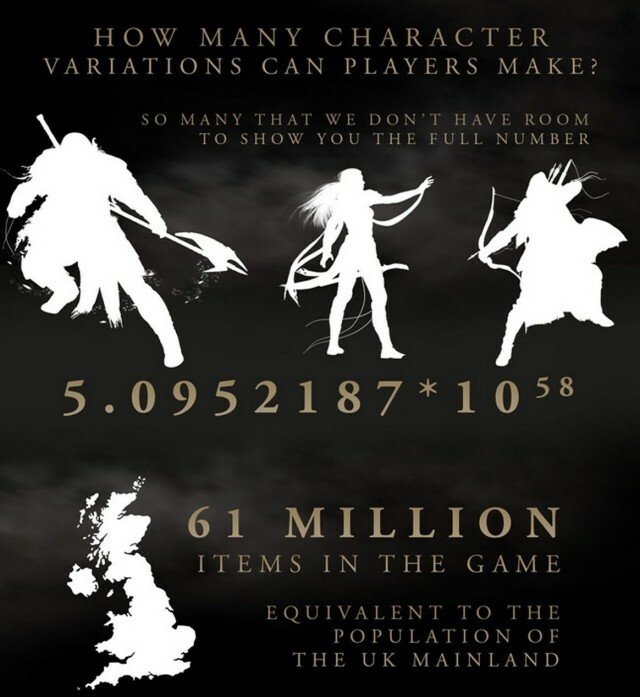 The landmass in-game is equally massive, with some players estimating a straight run across the map taking a little over eight hours. That’s a huge area to explore. I’ve only been exploring the opening areas in my newbie journey and enjoying the wide-open vistas and visual set-pieces almost more than I have the actual mechanics of playing the game. All you need to decide, though, is whether the $60 up front cost and subsequent $15 per month subscription is worth your time. Elder Scrolls Online requires a significant commitment, in bandwidth (it’s a hefty 22 GB download), up front cash, and the amount of time you can sink into. The OCD will enjoy the micromanagement of equipment and character stats and abilities, but frankly I’m a gaming social climber who performs tedious management work so I can go see areas that require the higher levels and better spells. The graphics card in my Macbook Pro allows me to crank up the graphics to High settings. Even though there’s another setting higher (Ultra), the fact that I can lose myself in the game’s environment at the lower graphical setting is a testament to the artists and developers as well as the technical prowess of their game engine. Really, though, Elder Scrolls Online is a World Of Warcraft-style MMO that I want to spend time in. The mechanics of motion and questing (at least at first) will be familiar to any WoW player, with various movement keys on the keyboard and hot-keys for spells and potions. The difference here is that Elder Scrolls Online brings the action-RPG elements from it’s earlier iterations in Skyrim and Oblivion, making the mouse more important than it is in typical MMOs, the battles more active. You have to move around to avoid getting hit, clicking like crazy on your mouse right and left buttons (seriously, get a double-button mouse, already) just to stay alive in early fights. When you die, and you probably will more than once, you’ll go to a special Wayshrine to reincorporate, which also doubles as a fast travel system. That? That’s a staircase from the backside. Send help. That’s not to say my immersion isn’t shaken by a few glitches and broken quests. There’s one early quest that asks me to find various injured sailors and give them some potion that I also have to run around and gather. Why the potion is just lying around on the sand, I’ll never know, but that’s not the point. When I reached the final sailor and gave her the potion, she’s supposed to finish the quest so I can get my experience points, gold, and any good loot. This lady, though, just keeps looping through the conversation, thanking me for the potion, but never actually getting up. I gave her something like seven potions, even after logging out and back in of the game, restarting it, and so on until I gave up. A quick search online told me that yes, the quest was broken. Bummer. Some of the visual glitches can be funny; the series has spawned its fair share of Fail Blogs. Some issues, though, require I drop into the games ‘/help’ system and report them as bugs, like the time I started to run up some stone stairs, only to find myself under them instead, with no way out. I could see lords and ladies standing around on the supposedly solid landing above, and through all the walls around me, but the game insisted that these walls I could see through were solid, so why should I be able to walk out of them? That’s just crazy-talk. I was able to get out with a “/stuck” command that basically just killed me so I could resurrect at the nearest Wayshrine. None of this ruins the game for me, though, as I keep jumping back in to play. The visuals alone are enough to keep me busy, for now. When I run out of obvious quests, I just start running around the area, out of the city, up and down roads and hills. This is a marked contrast to other MMOS I’ve played where I tend to log out when I run out of things to do. The moon is starting to come out in-game, now, so I’m off to explore the night side of this lush world — I hope I don’t run into too many werewolves. Wish me luck.